This project, funded by the Arts and Humanities Research Council, aims to recover the multiple experiences of theology in late-medieval Italy, focusing on Florence in the 1280s and 1290s, and to examine the way in which Dante engages with the forms of these experiences in his Commedia. The project will draw together a team of seven researchers, based in the Leeds Centre for Dante Studies in the University of Leeds, and in the Department of Italian in the University of Warwick, to cast light on the ways in which medieval theology was mediated and experienced within a specific historical and geographical context, paying close attention to its varieties and their effects upon different publics. In doing so, it will re-evaluate a key dimension of a fundamental work of world literature, a work which is increasingly recognised not only as being central within the European literary tradition, but also as a distinctive and unique theological voice in its own right. As well as research outputs, the project will develop significant opportunities for the public to benefit from its findings, including through concerts and web resources. The project will draw on and develop a well-established link with the leading North American centre for Dante studies, the Devers Program at the University of Notre Dame. The project is supported by the Arts and Humanities Research Council. Each year the AHRC provides funding from the Government to support research and postgraduate study in the arts and humanities. Only applications of the highest quality are funded and the range of research supported by this investment of public funds not only provides social and cultural benefits but also contributes to the economic success of the UK. For further information on the AHRC, please go to: www.ahrc.ac.uk. This project explores the multiple experiences of theology in Florence in the period 1280-1300, when Dante engaged in theological study, and examines the ways in which Dante's Commedia responds to those experiences. The project therefore casts light on the ways in which medieval theology was mediated and experienced within a specific historical and geographical context, paying close attention to its varieties and their effects upon different publics; in doing so, it will re-evaluate a key dimension of a fundamental work of world literature, a work which is increasingly recognised not only as being central within the European literary tradition, but also as a distinctive and unique theological voice in its own right. 1. Theological learning in Dante and Dante's Florence This strand examines the sites of theological learning in Florence, asking what an educated layman like Dante might have learned at the Scuole of Santa Croce and Santa Maria Novella in the 1280s and 1290s, and the forms that learning might have taken. The models of theological practice will be considered in relation to the Commedia's own presentation of theological ideas. The strand will reshape established debates on Dante's perceived theological allegiances by examining the ways those currents of theology appeared and interacted in the local context of Florence, and how the poetic narrative of the Commedia draws on these models. Prof. Simon Gilson and one post-doctoral researcher, based in Warwick, will develop this strand. 2. Religious culture and the mediation of theological ideas in Dante and Dante's Florence This strand of the project examines the ways in which theological ideas were mediated in late-medieval Florence beyond the learned context - in popular culture, liturgical practice, preaching, and visual art. By foregrounding the forms taken by "doctrinal" ideas and theological debates, this strand of the project analyses the ways in which Dante's poetry draws on and recasts these forms of theological expression. Source materials to be examined include liturgical sources, visual imagery, and semons and preaching guides. Dr Matthew Treherne and one post-doctoral researcher, based in Leeds, will work on this strand. This strand of the project will examine the theologians who appear as characters in the Commedia, in order to consider the models that existed for mediating the theologian as a historical figure. By casting light on the notion of the person of the theologian in late-medieval Italy, and the nature of his authority, this strand explores the model of theological discourse presented in the Commedia, as a personal, social interaction with individually named and characterized theological authorities. Dr Matthew Treherne and one doctoral researcher will work on this strand. 4. Dante, theology and socio-political thought This strand of the project will examine the close interaction between Dante's religious thought and his social and political ideas. It will take as its starting point the presence of biblical allusions and references in works by Dante on political themes, and will consider the ways in which Dante's contemporaries in Florence drew on religious thought to analyse contemporary political and social affairs. In particular, this strand of the project will consider the ways in which the prophetic mode informed and helped shape political discourse, connecting the social context of its audience with broader questions of theological significance. Dr Claire Honess and one doctoral researcher will work on this strand. This project will be carried out by a team of researchers. Dr Ruth Chester will work on the ways in which modern visitors to Dante's Florence can experience late medieval religious culture and benefit from the findings of the research project. Kevin Marples and Abi Rowson are the two doctoral researchers on the project team. Kevin is working on "Prophecy, Politics and Theology in Dante"; Abi is working on "Theologians as Characters in the Commedia". Kevin and Abi are based in Leeds. Lois Haines, a student of French and Italian, will form a key part of the project team, conducting research and preparing materials to support the public outreach activities of the project. Her scholarship is funded through the University of Leeds Alumni Annual Fund, supported by donations from former students and friends of the University of Leeds. Prof. Brian Richardson (University of Leeds). Dr Matthew Treherne (m.treherne@leeds.ac.uk), tel: +44 (0)113 3438612; Prof. Simon Gilson (s.gilson@warwick.ac.uk), tel: + 44 (0)24 7657 3095; Dr Claire Honess (c.e.honess@leeds.ac.uk), tel: +44 (0) 113 343 3631. To receive regular updates, please sign up to our mailing list by emailing Dr Treherne. Follow the project's development on Twitter (@leedsdante) and on Facebook (search for "Leeds Centre for Dante Studies"). 9 July 2013, 9.30-11 am: Session on "Dante and Late Medieval Florence" (papers by project members Matthew Treherne, Anna Pegoretti, Nicolo' Maldina) at the biennial conference of the Society for Italian Studies, University of Durham. Details here. 17-28 June 2013: Dante's Theology: A Summer Seminar on Theological Dimensions of Dante's Work, Tantur Ecumenical Institute, Jerusalem. Organised by Italian Studies at the University of Notre Dame, in collaboration with the Leeds Centre for Dante Studies. Details here. 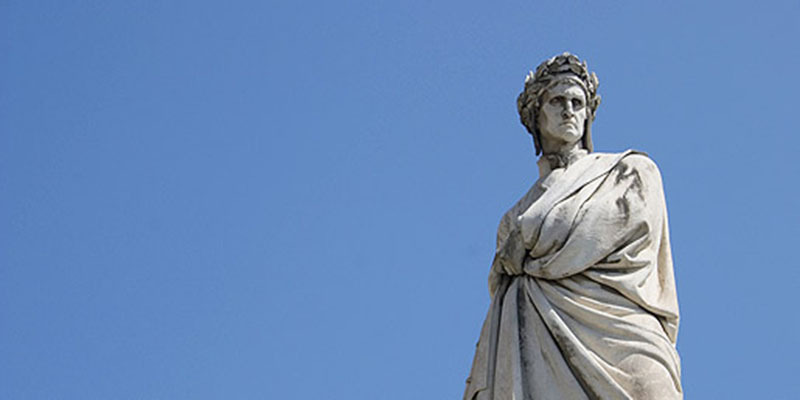 13-14 June 2013: Dante's Theology in Poetry, Practice and Society. Conference organised by the Devers Program in Dante Studies and the Leeds Centre for Dante Studies. Held at University of Notre Dame in London, 1 Suffolk Street, SW1Y 4HG. Details and registration here. Bologna, 31 May 2012, 11 am: Studiare Dante in Gran Bretagna. Presentation of the project, and discussion of Dante studies in the UK more broadly, with members of the Leeds Centre for Dante Studies (Matthew Treherne, Anna Pegoretti, Nicolo' Maldina) and of the Dipartimento di filologia classica e italianistica, University of Bologna (Gian Mario Anselmi, Andrea Battistini, Giuseppe Ledda). Details here. Bristol, 16 February 2012: Dr Matthew Treherne introduces the project in the Department of Italian research seminar at the University of Bristol. Details to be confirmed; please contact Dr Ruth Glynn (R.S.Glynn@bristol.ac.uk). Cork, 7 February 2012: Dr Matthew Treherne introduces the project in a public lecture at University College Cork, as part of the Dante Public Lecture Series. 7.30 pm in Boole Lecture Theatre 1, University College Cork. For information on the series, contact Dr Daragh O'Connell (Daragh.OConnell@ucc.ie). The lecture is available at http://www.youtube.com/watch?v=vk9z94jyPtM. Details of publications based on the project will be available here.